Laëtitia Guilbaud was born in France in 1980. Her work is all about women. 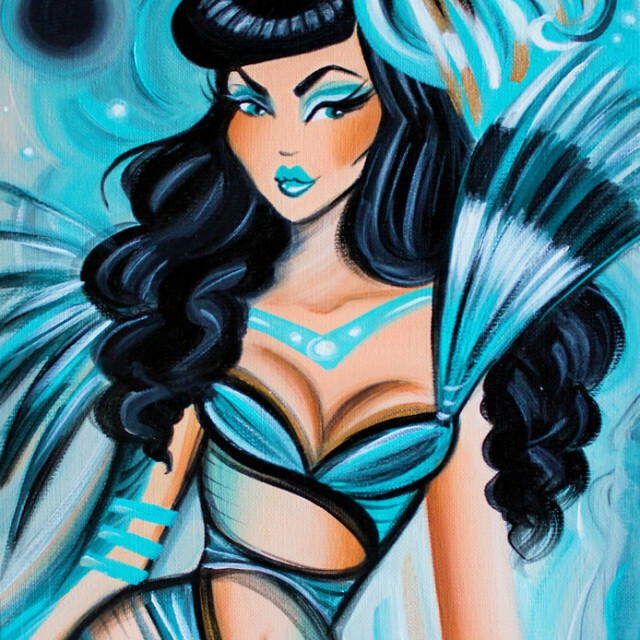 She is inspired by fashion and Pin-up art. This is why she likes to depict them with plenty of character and femininity. From an early dark abstract and provocative start, Laetitia’s paintings have evolved into a more colourful image of modern women. Since an early age, she has been sketching imaginary females. In 2003, after an art degree in Rennes, she decided to paint them with acrylic on canvas. She started to exhibit in bars, restaurant and art fairs. She lived in Scotland from 2006 to 2016 where she became a full time artist in 2008. She has had several articles written in relation to her work, especially regarding celebrity portraits. In 2009, she depicted the Scottish first minister, Nicola Sturgeon, then health minister, in a provocative painting holding a whip and a pint. Laetitia exhibits her work in galleries across Britain. She has also had exhibitions in France, Belgium and Italy too. Her work is often shown in charity events. Laetitia came back to live in France in 2016. She lives and works in Saint Gilles-croix-de vie.